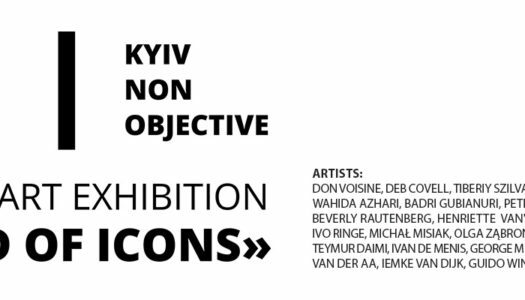 KNO | Kyiv Non Objective in collaboration with Dzyga Art Centre is proud to present an international exhibition of nonobjective art, entitled The World of Icons. The show’s participants will include Don Voisine, Deb Covell, Tiberiy Szilvashi, Elena Dombrovska, Billy Gruner, Kyle Jenkins, Wahida Azhari, Badri GubiaNuri, Peter Holm, Kevin Finklea, Linda Arts, Sarah Keighery, Beverly Rautenberg, Henriette Van’t’ Hoog, Li Trincere, Matt Feyld, Dolf Verlinden, Ivo Ringe, Michal Misiak, Olga Zabron, Marinda Vandenheede, Serhiy Popov, Turi Simeti, Teymur Daimi, Ivan De Menis, George Meertens, Werner Windisch, Myroslav Vayda, Richard van der Aa, Iemke van Dijk, Guido Winkler. The World of Icons showcases works by artists from Europe, the USA, Australia and Ukraine whose careers are closely associated with nonobjective art and its contemporary trends, including reductive art and post-formalism. Their visual vocabulary has a broad range of expressive means. The World of Icons concludes the international project Icons, organizes by KNO | Kyiv Non Objective art union and hosted throughout 2018 by the exhibition space of the Mikhail Bulgakov Museum. The project was conceived and realized as a series of experimental exhibitions uniting artists from various countries, with the museum space becoming a laboratory for their art practices. The notion of an image in art was the project’s recurring theme. Under the aegis of Icons, artists probed the question of whether an image can exist in nonobjective art, given that it only manifests itself in its pre-verbal stage in these works. Can nonobjective art become a form of aesthetic appropriation of the world and feelings, or function as a form of reflection in the world of abstract categories? Summing up their reflections, the artists created a new exposition in the museum’s laboratory space every month. “Answering” research questions, the artists appended the titles of their projects to the general title “Icons.” This produced such projects as Icons\Objects, Icons\Structures, Icons\Nonobject, and more. Summarizing their experience, one can say that nonobjective art is not just about playing with shapes and colors. The artists explore subtle connections between various categories of the metaphysics of existence with their works. The viewers, in their turn, are offered a strikingly different space for observing and experiencing reality, in which the basic categories of art, aesthetics and philosophy are brought into harmony. KNO | Kyiv Non Objective is an art union founded by Ukrainian artists in 2017. The goals and activities of the union focus on furthering the tradition of nonobjective art in Ukraine, forming an international multidisciplinary platform for showcasing various art practices, and developing new concepts in the sphere of contemporary nonobjective art.